Everyone knows what a jukebox is. Jukeboxes have been an iconic piece of music equipment found in bars and pubs that you could drop a coin in and pick a music selection to hear and enjoy, or even grab your date and have a quick dance. Plenty of songs have been written about a jukebox, from the country song Don’t Rock The Jukebox by Alan Jackson to Jukebox Hero by Foreigner, and even an album by Bruno Mars named Unorthodox Jukebox. It’s without a doubt a piece of music equipment that everyone has used, from children to adults, and is an important entertainment piece that bars and pubs should have available for their guests to pick music and enjoy while in their establishment. Jukeboxes haven’t changed much since they were invented around the 1890’s. The biggest changes to happen to jukeboxes were necessary because of the medium music was available on at the time. Starting with paper rolls and metal discs in the very early years, upgrading to loudspeakers and record players organized in creative orientations to allow more selections for a patron to play. Over the years, better automation technology was invented to allow for larger libraries of records in a jukebox to be available to play. The most recent and notable advancement to jukeboxes have been a computer and the internet. By using large capacity hard drives to store the music in digital form in a computer that was hooked up to the internet and combined with a touch screen for the patron to choose their music, jukeboxes have evolved into more of a personal music player mounted on a wall, but still holding true to its roots, charged patrons to hear music. Personal cellular phones have moved away from the flip-phone style and have grown in size with a touchscreen, known as a smartphone. Smartphones have become more and more popular with consumers because of all the things they can do. 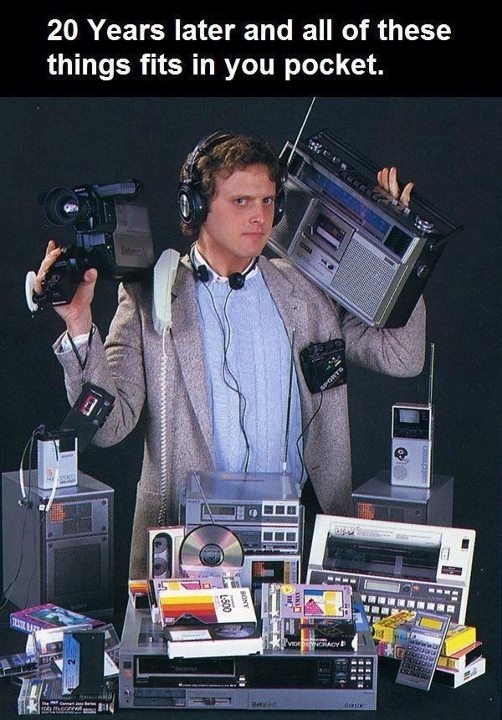 They’re amazing pieces of technology that can fit in your pocket. Although this guy looks pretty freaking cool and proud, do you notice something that isn’t in this picture? Yup, there isn’t a jukebox in the picture. This doesn’t mean a jukebox can’t be controlled with a smartphone. I like to believe that it would’ve taken up too much of the picture! JukeVision combines all the latest advancements in computer technology, harnessing the fact that everyone has a smartphone, taking advantage of social media trends, marketing needs, and still allowing patrons to conveniently browse the music in the jukebox on their smartphone and request it to play with our JukeVision jukebox in a bar or restaurant. If you’re wondering why you should have to spend thousands of dollars on a music player that hangs on your wall to play music in your establishment, you’re not alone. JukeVision is a great music and marketing tool for your business. Contact us now to request a demo of JukeVision so you can learn more about how it can help your bar or restaurant marketing, entertainment, information and increase sales and revenue.